Atlassian provides tools to help development teams more effectively collaborate and deliver software fast. Atlassian introduced Bitbucket Pipelines in 2016 to automate continuous integration in a seamless way with the git repository. As Bitbucket Pipelines has matured we’ve seen more of our customers taking advantage of its ability to easily integrate CI/CD into the Bitbucket git repository, and use its extensive set of integrations to extend their workflows. The Atlassian way for working with source code and workflow is highly complementary to the JFrog Artifactory as a repository manager. Atlassian has been a great partner to JFrog over the years, with several integration points including, most critically, the ability to use JFrog Artifactory as the repository for Git Large File Storage (LFS) together with Bitbucket LFS. In this blog post, we show how to use Bitbucket Pipeline and JFrog products to containerize and distribute node applications in a highly scalable way. Trace your builds easily once you have published the build information to Artifactory. Gain visibility of the used dependencies. Generate information about the build environment. 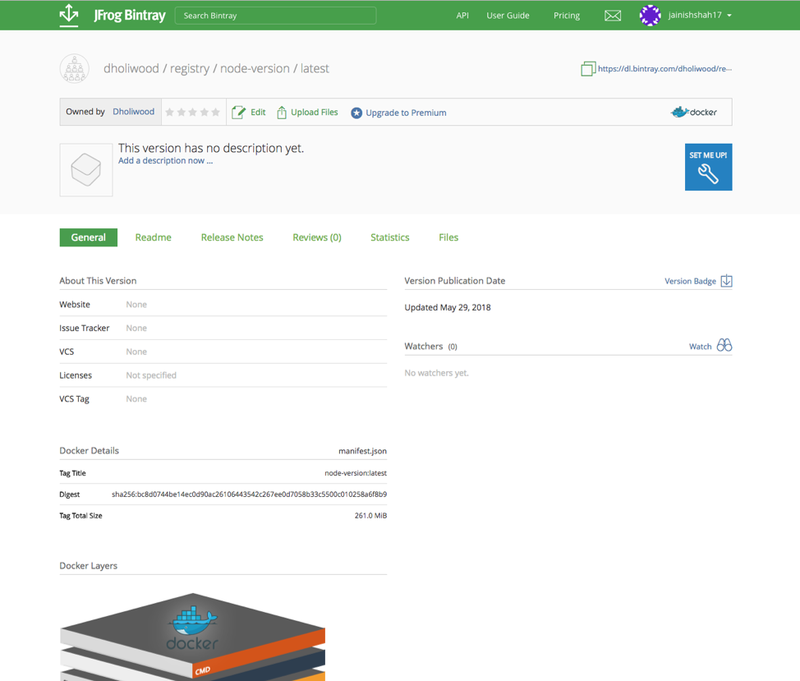 Scan your builds for potential vulnerabilities and license violations with JFrog Xray. 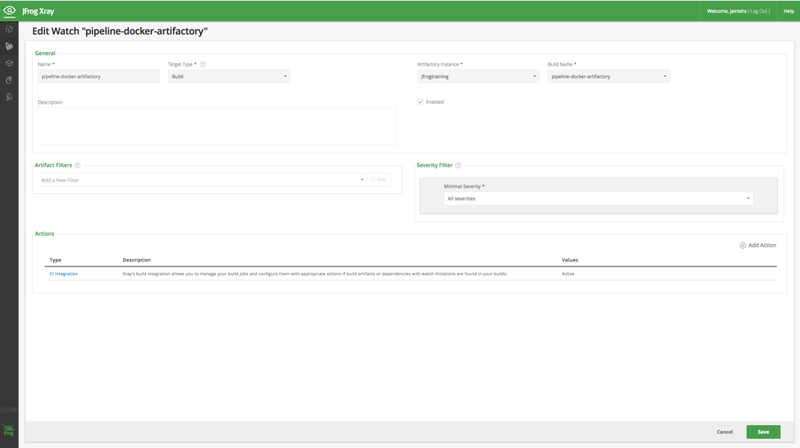 Distribute your build artifacts with JFrog Bintray. How are the JFrog products integrated into the Bitbucket pipeline? The Bitbucket pipeline automates the build and test flow while using JFrog Artifactory as your repository manager. JFrog Xray then scans the packages for vulnerabilities. JFrog Bintray proceeds to distribute the images closest to the target location. First, we will use JFrog CLI to integrate Bitbucket Pipeline with JFrog Artifactory, JFrog Xray, and JFrog Bintray and then we’ll proceed to automate the entire process. Download and install your npm client. Download and install your Docker client. Create a repository in Bintray. You can clone your npm project. In our example, we have cloned the pipeline-docker-artifactory project with the following Git command. All you have to do is run the following command. Proceed to modify your Artifactory server name, URL, Artifactory username and password as follows. Run the following npm install command that refers to the npm virtual repository as a source for the dependencies. It’s time to generate some information. We recommend adding the Git VCS details using the following build-add-git command. You can also collect the environment variables using the following build-collect-env command. If you already have npm scripts, we recommend renaming your existing prepublish and post publish scripts in the package.json file. When the npm-publish command runs, the JFrog CLI runs the pack command in the background and not the standard publish command. If your npm package includes the prepublish or postpublish scripts, rename them to prepack and postpack, respectively. To publish the package, run the following command. Configure the Docker registry in Artifactory with a reverse proxy. Alternatively, you can configure your Artifactory using the new proxyless option for non-production setups. To make sure that the Docker client and the Artifactory Docker registry are configured correctly, run the following commands in order to pull the hello-world Docker image and then push it to Artifactory. Package your node microservice in docker image. Test the newly created docker image. Type http://localhost:3000/ in the browser. You will see the page as shown below. To push the image and the build info to Artifactory, run the Docker Push Image CLI command. Run the following build publish command. To scan your build using Xray, configure a new watch for the build as follows. To scan a build, use the following command. Build promotion is usually used after testing or building a scan, optionally moving or copying the build artifacts and its dependencies to a target repository. To promote the build, run the following command. $jfrog rt bpr pipeline-docker-artifactory 1 docker-repo --status="Staged"
See the promoted build in Artifactory. Build distribution is usually used to deploy builds from Artifactory to Bintray, and creates an entry in the corresponding Artifactory distribution repository specified. Use the build distribution command to distribute the build artifacts from Artifactory to Bintray after promoting the build. You can add a number of optional flags to the command. For example, the –publish and –override flags. The command refers to the npm distribution repository as a target for build distribution. The is the distributed build in Bintray. You have successfully deployed your node microservice Docker image manually to Bintray. Now let’s automate the process using the Bitbucket pipeline. Copy the bitbucket-pipelines.yml file to the root of your npm project code in Bitbucket and enable the Bitbucket pipeline. Here is an example that shows you how to containerize your Java microservice using the Bitbucket pipeline and JFrog CLI.